Palimpsests were medieval docments that were erased and then reused a number of time in order to preserve precious paper. The erasure were not perfect and traces of older writing often showed though, building up, layer by layer, a kind of ghostly record of all that had gone before. In a sense, most of Southern Italy could be called an archaeological palimpsest. The region of Basilicata (or Lucania) is a case in point. There are still remnants of the ditch villages of pre-European peoples from 8,000 years ago. On top of this there are signs of early Indo-European peoples such as the Oenotrians and the early Greeks of Magna Grecia who displaced them in the 8th century, b.c. This is mixed with signs of Italic tribes such as the Lucanians, Oscans, and Samnites, all absorbed by the civilization which was ultimately to leave its own indelible imprint across three continents: the Romans. Then came the Lombards, Byzantine Greeks, the Normans, the Angevin French, the great Spanish realm of Charles V, (on whose empire "the sun never set"), and so forth down to our own day when the area was taken up into a united Italy. The sassi came into their own between the 8th and 13th centuries AD, when the caves became a refuge for groups of monks persecuted in the Iconoclast controversy that shook the Byzantine Empire. In Matera, these refugees were isolated and safe in a no-man's land between waning Byzantine power further south and unstable Lombard influence to the north. The monks moved into the caves and built halls, sanctuaries and chapels. Later, many of the cave dwellings were taken over by peasants as homes for themselves and quarters for their animals. Over the last millennium, houses have organically grown out of the original fissures and caves; steps, roofs and balconies have been added; everything is arrayed in an irregular jumble, layer upon jagged layer, roof to wall, balcony to doorstep, all so helter-skelter that the overall impression is that of a beehive built by bees who don't like following orders. On a more sombre note, writer Carlo Levi, upon seeing the sassi for the first time, said he was reminded of his childhood visions of what Dante's Inferno must have looked like: the descending layers spiralling down into darkness and who knows what awful perdition and, when the sassi were still inhabited, the thousands of candles glimmering in the small windows at night might indeed have looked like fires burning in hell. Levi's infernal vision notwithstanding, others have seen quite the opposite in Matera. The strange combination of age and agelessness about Matera lends it a Biblical quality, and here is where, in 1964, director Pier Paolo Pasolini filmed his life of Christ, The Gospel According to Matthew and where, in 2004, Mel Gibson filmed The Passion of the Christ. The entire complex is perhaps the most outstanding example anywhere in the world of spontaneous rural architecture, yet the problems of great numbers of people living at such close quarters were enormous. There have been utopian claims that the 20,000 inhabitants living in the sassi at mid-20th-century were a unique example of peasants, landowners, shepherds, craftsmen, merchants and laborers living in social harmony. The modern Italian state did not see things quite that way. It saw an infant mortality rate of 43%(!) and a medieval folk magic that treated ills by sprinkling the blood of a freshly slaughtered chicken on the victim. Laws were passed during the 1950s to alleviate the overcrowded and unhygienic living conditions. This meant moving most of the people out. New quarters were built in the town of Matera, itself, and the sassi have now essentially become empty shells, except for a small and strictly limited number of inhabitants. The area has become, as well it should, an object of tourist interest, and this has led to an ongoing project to keep the houses, churches, villas, the small squares and long flights of stairs of the sassi from deteriorating. As noted above, the sassi have been added to the UNESCO World Heritage list of cultural artifacts worth preserving at all cost. Aside from the houses, themselves, there are in the area a great number of ancient cave churches displaying Orthodox as well as Catholic ornamentation within. 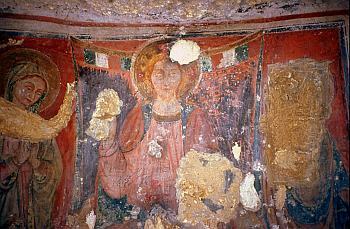 Time and vandals have ravaged them to a certain extent, but some original Greek icons on cave walls are still clearly visible and venerable. Even traces of prehistoric habitation can be found within some of the caves. *The European Capital of Culture is a city designated by the European Union for a period of one calendar year during which it organizes a series of cultural events with a strong European dimension. The EU has been doing this since 1985. Other Italian cities selected in the past have been Florence, Genoa, and Bologna. 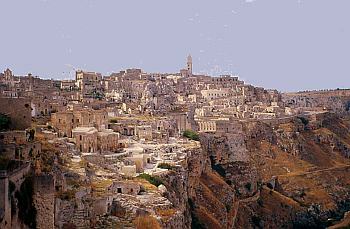 Matera is the first southern Italian city to be chosen. Generally, two European cities are selected for each year; the other European Capital of Culture for 2019 will be Lovdiv in Bulgaria. Selections are announced a few years in advance to give the city time to prepare. Maltera was selected in 2015, at which time it was chosen from among the other "shortlisted" cities in Italy: Cagliari, Lecce, Perugia, Ravenna and Siena. If you want to actually buy one of the sassi dwellings and restore it, you can do that, too, and get a 50% subsidy from the state! On the other hand, if you just want to visit for a day, it's only a few hours south of Naples on a fast autostrada. I had a kind letter some years back from Elizabeth Jennings of Matera, who told me that "...A goodly portion of the Sassi are now restored and the area is a beehive of activity, particularly in summer. Restaurants, bars, pizzerias, salsa clubs...the streets hum with the sound of foot traffic and voices...concerts and plays...and a plan to convert a huge grotto into the Casa Grotta, a big cultural center. The human overlay is very modern and young."